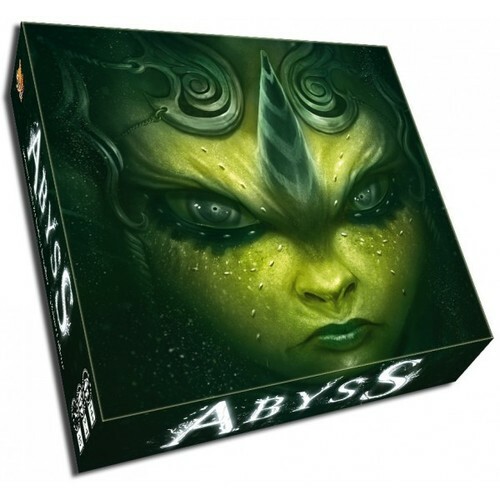 Abyss is one of the new releases distributed by Asmodee at GenCon 2014. It highlights one of the growing trends in gaming – namely that many companies are now looking at US releases in August at GenCon and then giving them a European release at Essen in October. 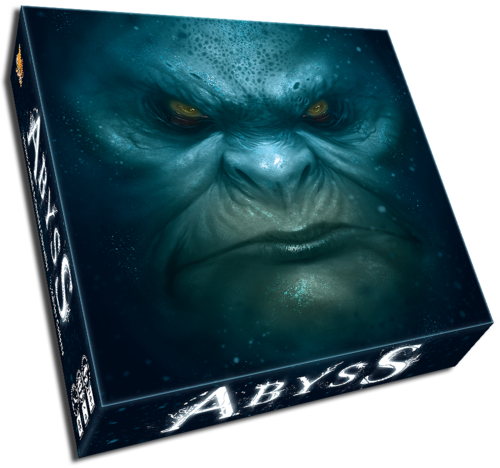 Abyss is also part of Mr. Cathala’s personal campaign to dominate GenCon releases (Abyss, Five Tribes and Madame Ching all debuted at the show). The version that I received was the blue cover. Interestingly enough, the game was produced with FIVE different boxes, one for each of the five races that you play with in this aquatic fantasy game. In this game, players are vying to be the next King of Abyss by exerting their influence over the five races of creatures that inhabit the Abyss: the blue Squids, green Shellfish, red Crabs, yellow Seahorses and purple Jellyfish. The game in a paragraph: The game is centered around three different decks of “cards” – the exploration deck, the Lords deck, and the Locations deck (which is made up of tiles, not cards). The exploration deck is filled with numbered cards from each race as well as a few deep-sea monsters thrown in for good measure. 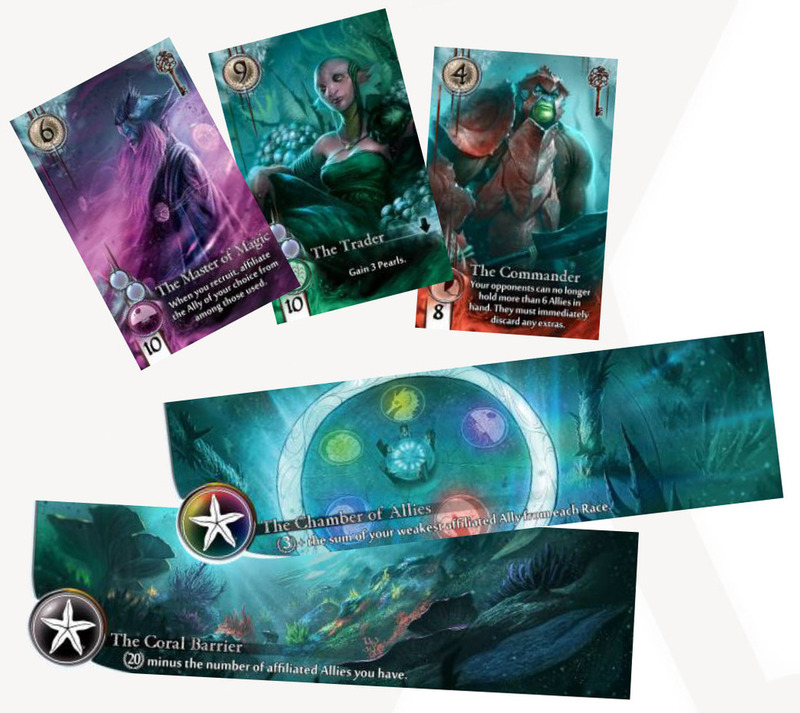 These numbered cards will be used to take control of Lords – cards which score VPs and often give special abilities to the players. These Lord cards are also one way to gain keys, and when you get 3 keys, you trade them in and take control of a Location tile, a tile which gives a base amount of VPs as well as a variable bonus VP score as well. The game with a bit more detail: Turns go around the board following the same three-phase pattern. 1) Plot at Court – if you want, you can spend a pearl to add a Lord to the lineup at Court – assuming there is an empty space to place the new Lord. A) Explore – Here, you draw the top card from the exploration deck and place it on the board. If it is a numbered card: Starting with the player to your right, each of your opponents has a chance to buy that card. The cost is 1 pearl for the first card, 2 for the second, 3 for the third card in that round. Each opponent may only buy one card per round. If they buy the card, they add it to their hand and pay you the cost. If your opponents pass on the card, then you get the chance to take the card into your hand. If you do, there is no cost and your turn is over. If you pass on this card, you leave the card on the exploration row (five spaces at the top of the board) and repeat the process. If this was the fifth (and final) card in the exploration row, you are obligated to take it, though you are rewarded one pearl for your stubbornness. If it is a monster card: your opponents do nothing here. You must decide to fight the monster or to leave it alone and keep exploring. If you fight it, you are granted a reward based on the fight track – pearls, keys or monster tokens which are worth VP at the end of the game. Your turn is over once you collect your reward, If you pass, the counter on the monster track is moved down, making the reward for the next fight better, and the monster card is placed on the exploration track. At the end of your exploration – regardless of which way that you ended the turn, any Ally card (numbered card) is placed face down on the board on the spot matching its color. All monster cards are placed in the discard pile. B) Take a pile of cards – rather than exploring from the deck, you can simply elect to take one of the five suited piles of cards from the center of the board. You can’t look at the cards beforehand, so hopefully you had been paying attention to what numbers had been placed in which stack from previous exploration phases! All of those cards are added to your hand. C) Recruit a lord – instead of adding cards to your hand, you will use those hand cards to recruit a Lord card. There will always be at least 3 Lord cards available for you to choose from. Each of them has a cost in the bottom left as well as a stipulation on which suit of card must be used as well as how many other suits must be used. You must meet the cost number using the appropriately suited cards from your hand. Of the cards that you use to buy the Lord, you take the LOWEST numbered one and put it in your scoring pile. Additionally, you take the Lord card from the board and place it in front of you. For the moment, this Lord is “free” which means that you are able to use any special abilities that are printed on it. The Lord cards all have their own VP value, and many of them come with a key in the upper right corner. Keys are used in the next and final phase of the turn. Of note, if you choose a Lord and there are only 2 Lords left in line, you get a 2 pearl bonus and then you refill the row of Lords. The only other way to add Lords to the display is to pay a Pearl per Lord card in the first phase of the turn. 3) Control a Location – if you have 3 free keys, you MUST take control of a Location. Free keys are either those on “free” Lords or on key tokens that you have received for defeating monsters. You can either take one of the previously exposed Locations already on the table, or you can draw between 1 and 4 tiles from the deck and choose from that selection. Any unchosen Locations are added to the face up display of Locations that all players can then choose from. Each Location comes with a base VP amount and some sort of conditional VP bonus. If you used Keys on Lord cards to get this Location, they are placed underneath the Location. The Lord card will still score you VPs at the end of the game, but you can no longer use it’s special ability nor can you use the key on it to take control of another Location. Game end – the game ends when a player recruits their 7th Lord OR when you can no longer refill the row of Lords on the display. Before you move on to scoring, all players place the lowest numbered card of each suit in their hand into their scoring pile. The player with the highest VP total wins the game. Ties go to the player with the most Pearls. 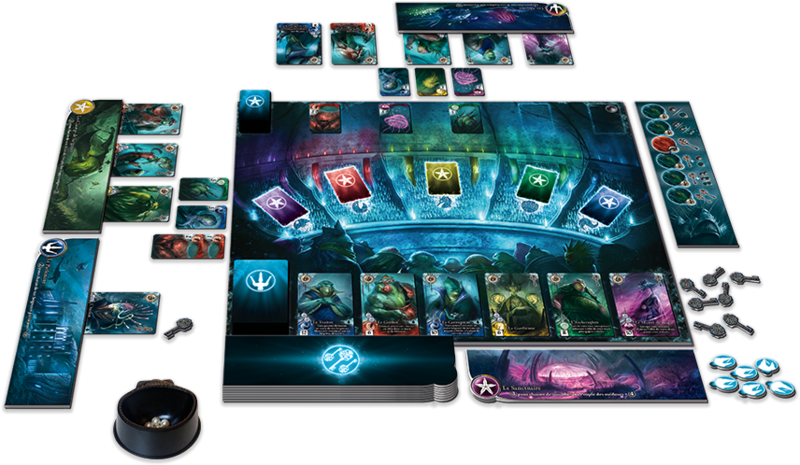 Abyss is an engaging set-collection card game. Though the game comes with a board, is in a 30cm box, and has a big stack of cardboard tiles – it is essentially a card game. I do not use this term derisively though – many other successful “boardgames” are also essentially “card” games when you break down the components – Dominion, Race for the Galaxy, 10 Days in the USA, Ra, etc. The game itself is a fairly complex affair, and the production values help sell the fact that this is a serious game. To use an example of another recent release, the complexity of this game feels similar to Sail to India. In that case, Sail to India comes in a smaller package and uses mostly cards for its components. However, despite the small box, it is the sort of game that would have felt just as right in a 30cm box with a board, larger cubes/chits for resources, etc. However, when I have pulled that game out with folks that aren’t familiar with it – I do hear complaints of “well, that’s just a card game”… Abyss is the same sort of game, but Bombyx has chosen to go the opposite route with it and package it as a full-size game. I like the two different ways to add cards to your hand. Sometimes, if you need a specific card (usually based on suit), you might elect to take a pile of cards from the Council – even if there is only one card in the pile! Otherwise, you can always gamble that the right card will come up (and not be purchased by your opponents) in the exploration option. Additionally, sometimes you need to go exploring and hope that good cards come up for your opponents as this is one of the few ways to add Pearls to your cup. You really need to work on getting the “right” cards in order to maximize your scoring from the Ally card that you keep each time you buy a Lord card. There is clearly a premium on the higher numbered cards. The different abilities on the Lord cards as well as the varied scoring bonuses on the Locations make each game different, and they force you to continually adapt to the new circumstances in each game you play. The powers on the Lord cards are quite varied, and I think that some powers are better than others – but you just have to deal with that as best you can! Getting a Location card early on can definitely help you plan your strategy for the rest of the game. Being able to maximize your bonus VPs is definitely an important thing to keep in mind as you collect and play cards. The art is beautiful, and it clearly evokes the sense of being in an underwater kingdom. 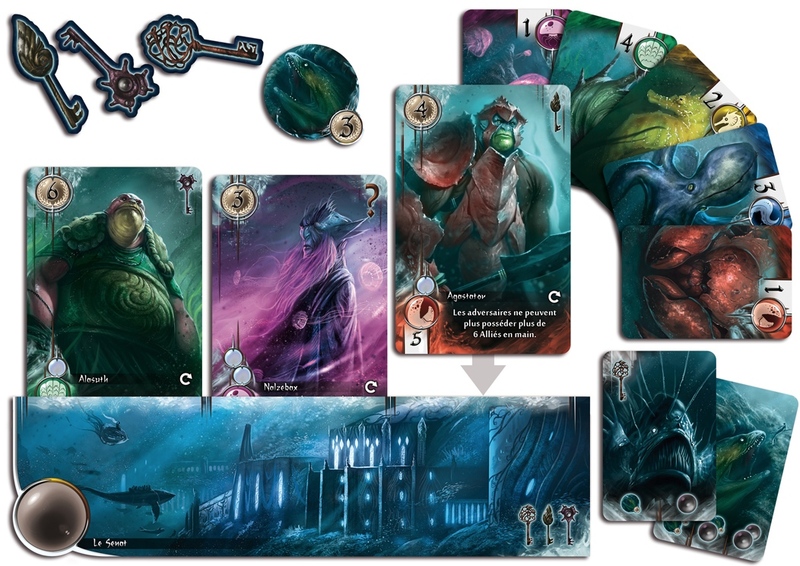 Each of the cards has individual art and some of the underwater landscapes on the Location tiles are simply breathtaking. This is, without a doubt, one of the best looking games I’ve seen in awhile. However, like many things seen in the depths of the water, a lot of important detail is lost due to the darkness of the theme. I wish that the cards were more easily distinguished as to which race they belonged to. Furthermore, while the board looks awesome with nothing on it, it’s really hard to see the spaces on the board as well as very difficult to see which colors are on the Council spaces because once you put cards face down on the spaces, there is no other obvious indication of color – yes, I know there are some slight highlights on the curved border above the cards – but it’s not easy to see, especially in a dark room. I’ve said many a time that I’m not a gaming parakeet, and I would usually trade functionality for slightly less awesome art – but I also know that I’m likely in the minority in this regard. The Pearls are also beautiful and extremely thematic – and thankfully, Bombyx has given you molded plastic cups to hold them in – because otherwise they’d roll all over the table! In the end, the graphic design quibbles do not detract from the game. Abyss is a very well constructed medium weight game. It plays quickly, and the fact that many turns involve exploration means that all players are involved in most of the turns in the game. There are a number of different ways to score points, and I have seen players win by focusing on different facets of scoring. At this time, this would be on my short list of games that I think has a shot for nomination for the SdJ in 2015. Karen M – I don’t know what it is about this game, but so far it is really hitting a sweet spot for me. It is definitely an “entry level” game with lots of appeal due to the thematic and gorgeous art. Although, as Dale mentions, the graphics could have been more distinct to make it easier to see what goes where on the board. I really enjoy the decisions you have to make during the course of the game. Should I try to hire and ally or just take a stack that is already on the board (yes, but what were the values again)? I think the designers have done a good job of adding just the right amount of complexity to keep the decisions interesting but not so much that you get bogged down in figuring out what you should do. I find the end game scoring a tiny bit cumbersome (figuring out which allies you must keep and therefore which ones will score) but once you go through it once, you understand it. Seahorses fighting ocean monsters, but no presence for the whales?